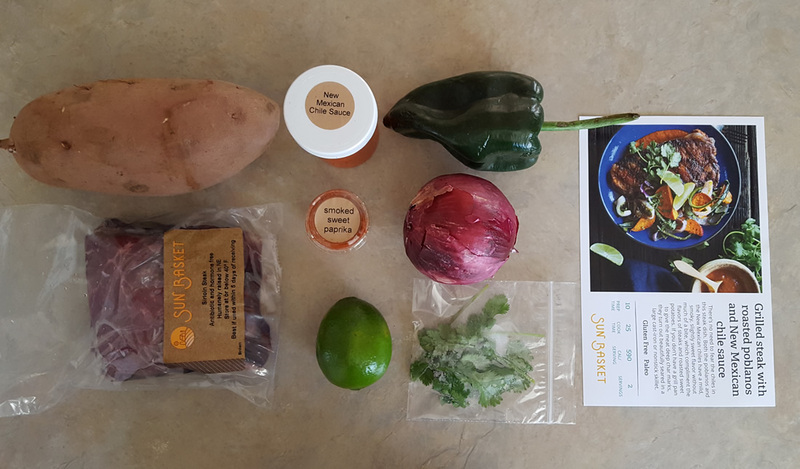 Sun Basket is all about fresh, sustainable cooking. They feature farm-to-table inspirations, organic ingredients and gluten-free options that are delicious and creative. Even better, Sun Basket is all about reducing waste – which is why they offer recycle information, use reusable ice packs and more. Sun Basket’s prices are fairly competitive, but it is still a big leap to take when you don’t know what you will receive. 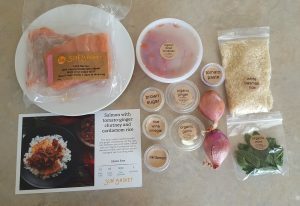 That is why I was more than happy to order up a week’s worth of meals (which is three meals) and scrutinize every flavor, ingredient and recipe instruction so you could see if Sun Basket's food and recipes are worth it. Let’s see how they worked out when I tried Sun Basket, shall we? This recipe is gluten-free and Paleo-friendly – which is cool considering most of us assume Paleo and gluten-free recipes are lacking flavor and fun. I was instantly drawn into the bright colors on the recipe card and intrigued by the New Mexican chile sauce – because I heart chile sauces. Sun Basket has a little more work to their recipes, but that isn’t a bad thing. They do have a few things finished for you – such as sauces. But, you are in charge of all the chopping, peeling, etc. 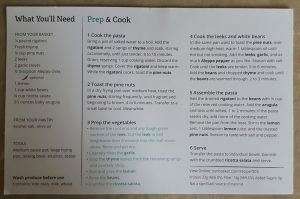 The recipe card states that prep time is about 10 minutes – and I say that is generous. It took me about five to prep everything. There’s quite a bit you have going on at once in this recipe – roasting potatoes, cooking a steak, etc. But, they break down the instructions so you aren’t overwhelmed. The only thing I thought was a little weird was that the sauce wasn’t heated at all, you just open and pour. Unfortunately, both steaks had a lot of fat running through. While a little fat is never bad – and keeps your steak nice and moist – this one had too much. Also, the steak was MUCH smaller in real life than what it looked like on the picture. I’m sure they strategically photograph, but I even used a small plate and the steak still looked small in comparison to everything else. Also, the smoked sweet paprika you put on the steak did not come through during cooking at all. 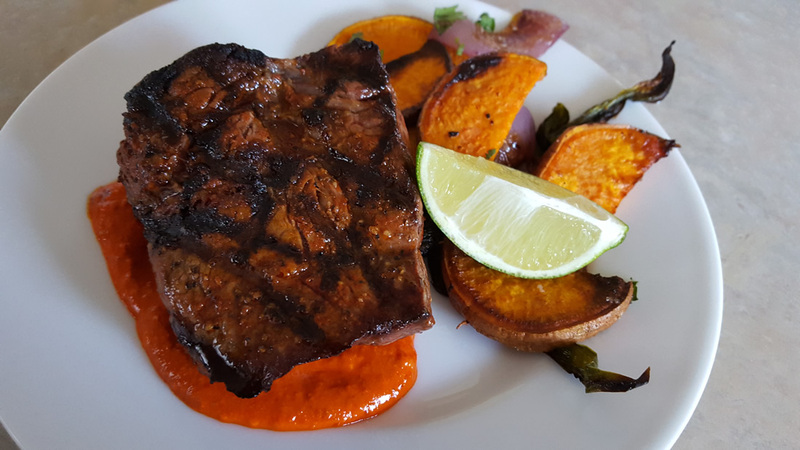 I didn’t taste anything on the outside of the steak – and I used all of the paprika. As I predicted, it was strange to not heat the sauce. The sauce was still slightly cold from being in the fridge – even though I took it out with the rest of the ingredients. I heated it myself as a secondary test, and the sauce was much more flavorful and more palatable when warm. I’m a big fan of sweet potatoes. Add some salt on those bad boys and I think they’re amazing. 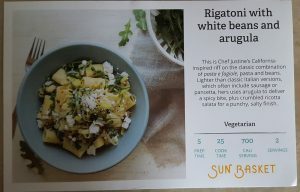 But, I don’t think I’d repeat this recipe at home or reordering it in the future from Sun Basket. It was definitely filling and had an OK flavor, but nothing I walked away remembering. This recipe was a vegetarian spin off of the classic Pasta e Fagiole, which includes pasta, beans, and sausage. This version uses a lighter finish and includes ricotta salata (something I wish my local store would carry). It's salty and basically a crumbled ricotta. For this recipe prep was extremely easy – and just like the card said, it only took five minutes. 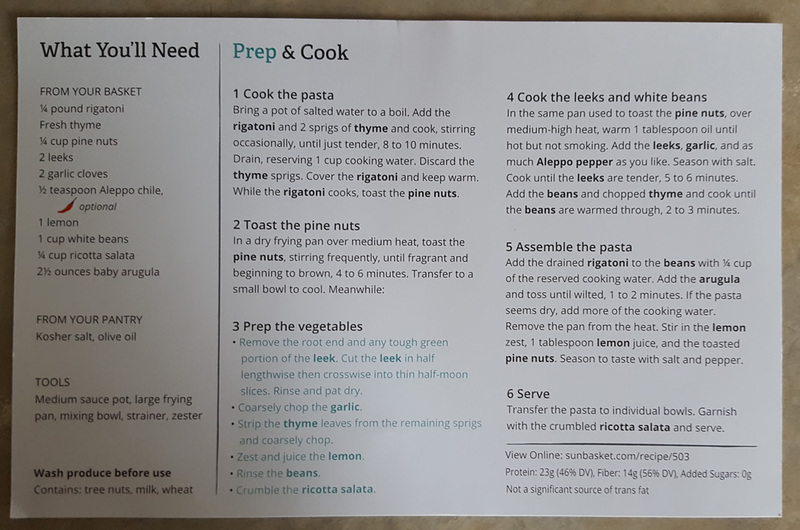 The recipe was fairly easy to complete – and most of the time was spent waiting on the pasta to cook (or the water to boil, should I say). I like how specific they are with instructions. They don’t just tell you how long to cook something – they also say how it should look. That way you’re not just going off time alone. This pasta was extremely refreshing. 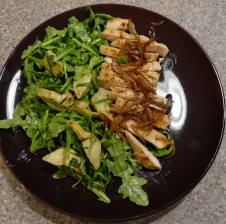 The final product looked fairly close to the recipe card too – but my arugula looked a little more wilted. The taste was excellent. You could really taste the lemon, which lightened up the heaviness of the beans. You didn’t miss the meat at all and the pine nuts added an excellent crunch – without them, I will admit the dish’s texture would have been definitely off. The portions for this dish were extremely generous. There was enough for two adults and a child – plus we all could have had seconds. I made this dish for myself, my mother and my 4-year old daughter. All three of us cleared our plates and definitely agreed we would eat it again. I am a big fan of salmon. After moving to Utah, I have become accustomed to flash frozen fish – never buy fish at the counter of your grocery store unless you know it is fresh. Most of the time, they’re defrosted frozen filets – and you’re better off in flavor and price getting the fish straight from the freezer section. 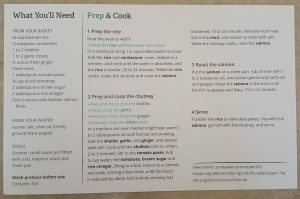 I specifically picked this recipe because of the salmon and the chutney. Chutneys are like a chunky combination of salsa and sauce. They’re delicious – and not used enough in my opinion. Prep for this recipe was fairly easy. Took me about 10 minutes to do (the card said 15). Most of the prep involved peeling and chopping. One thing I did have to do, however, was remove pin bones from the salmon. Now, they don’t tell you to do this on the card (but they should probably tell you to look). 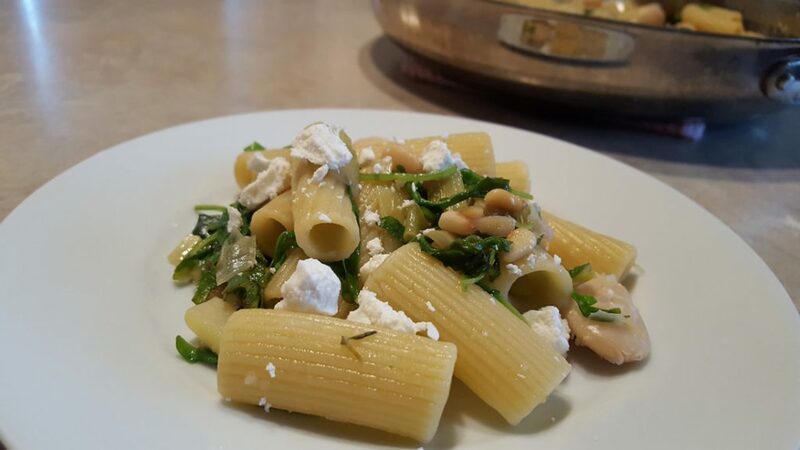 As a chef, I run my hand along a filet of fish out of habit for pin bones and I’m glad I did – I found four! If you ever buy fish or receive fish, always check for pin bones – you can’t rely on the fishmonger that packaged it to remove all of them (they’re pesky little suckers). This dish was very easy to cook too. 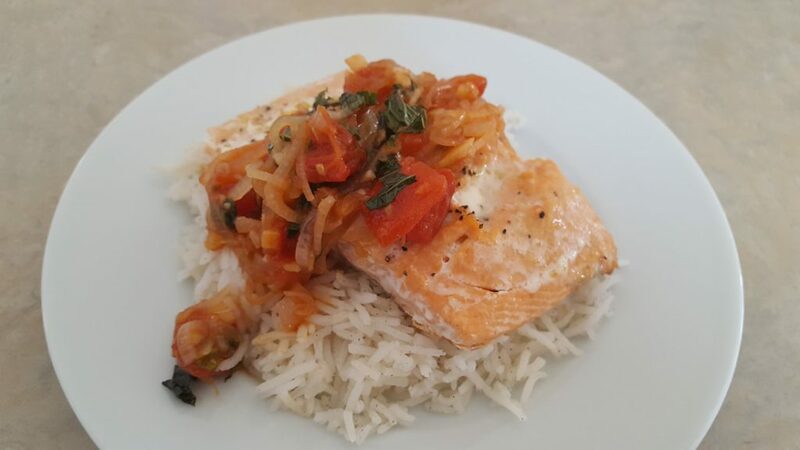 You roast the salmon, cook the rice on the stovetop and the chutney comes together with ease. Really, you spend most of the time just pouring stuff, mixing and letting it meld together. I was skeptical about how this would all come together – especially with all of the crazy flavors they had me using. Then, the salmon was left simple with nothing more than salt and pepper. But, once you plate it all together, the flavor is exceptional – and it’s a good thing the salmon was left simple (otherwise it could have conflicted with the chutney and fragrant rice). 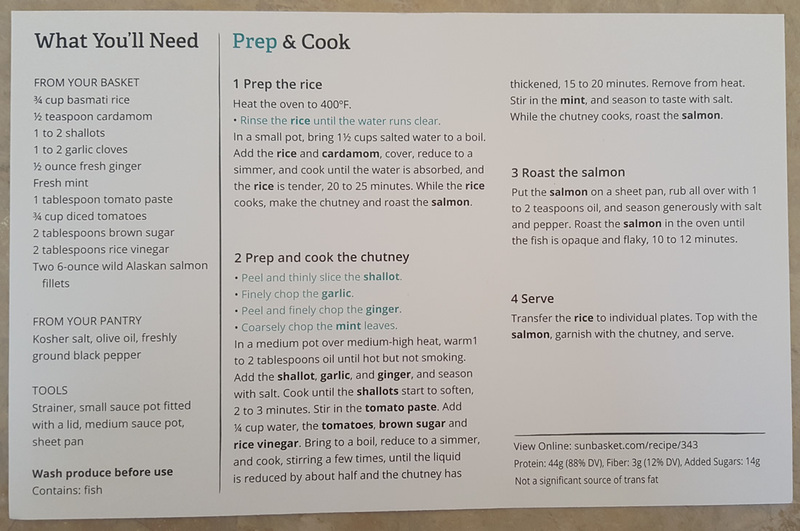 I even ate this rice as leftovers the next day because it was so tasty – who would have thought to add cardamom to rice? Oh yes, I would definitely eat this again. 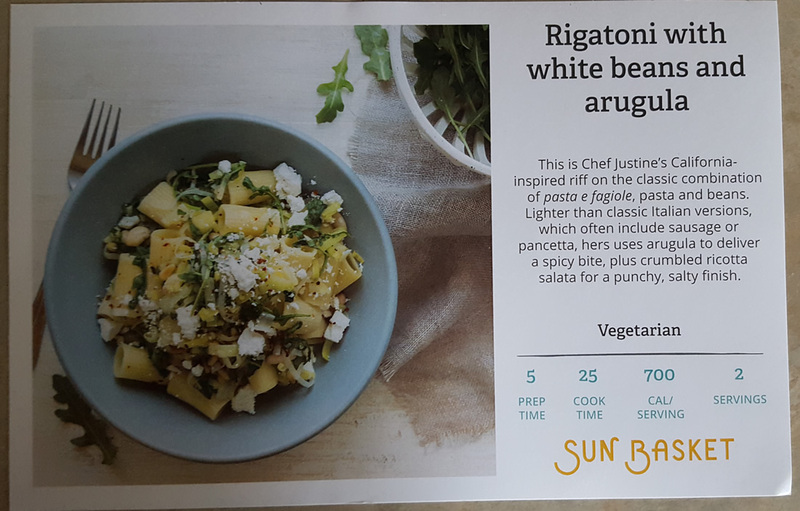 I saved the recipe card so I could remake it here at home, because I was impressed at the flavor combination. While you are using pungent spices, they really balanced out nicely and the dish was light and flavorful – perfect for summer. I really wanted to love the steak dish and possibly if there was more flavor and a few hiccups worked out in their recipe, Sun Basket would have received a 3 out of 3 from me. But, for now, I can only say I’d repeat two out of the three I received. But, if you were to ask me if I would order from Sun Basket again, the answer is absolutely. I was impressed with their recipes, pricing and quality of food. Read our full review of Sun Basket's food and products. 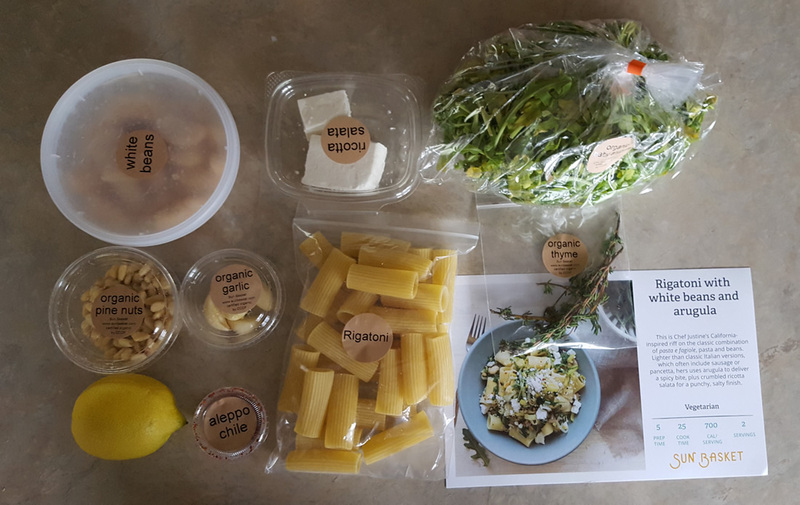 Check out all of the meal kit delivery services out there by checking out all of the reviews we've completed!